Perhaps you’ve noticed. 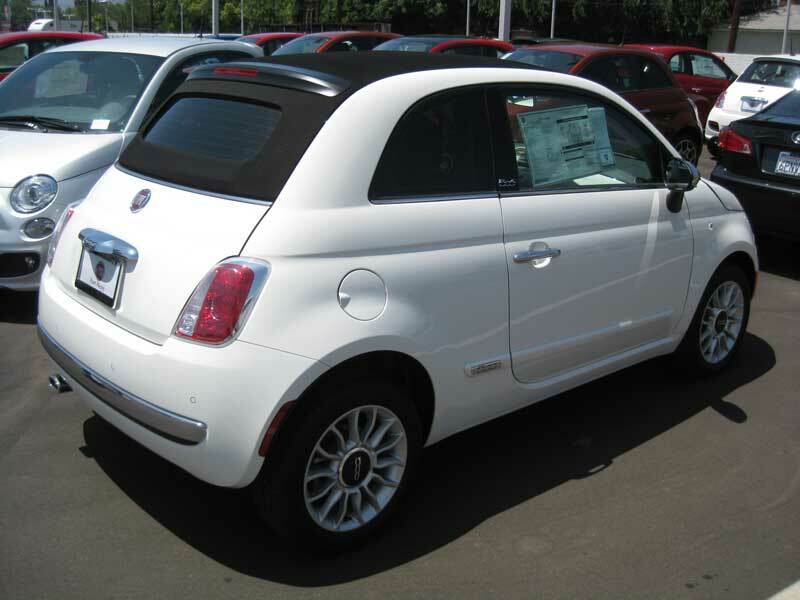 The diminutive 2012 Fiat 500 is showing up all around town. One Bianco (white) 500 parked in front of my home just a couple weeks ago. In May, on Olympic Blvd, I drove next to a Giallo (yellow) 500 that was being used as a chase car for a Chrysler Town & Country test mule. On my drive over Benedict Canyon to visit the freshly-minted Fiat of Van Nuys, a paper plate Argento (silver) 500 whizzed past me going the opposite direction. 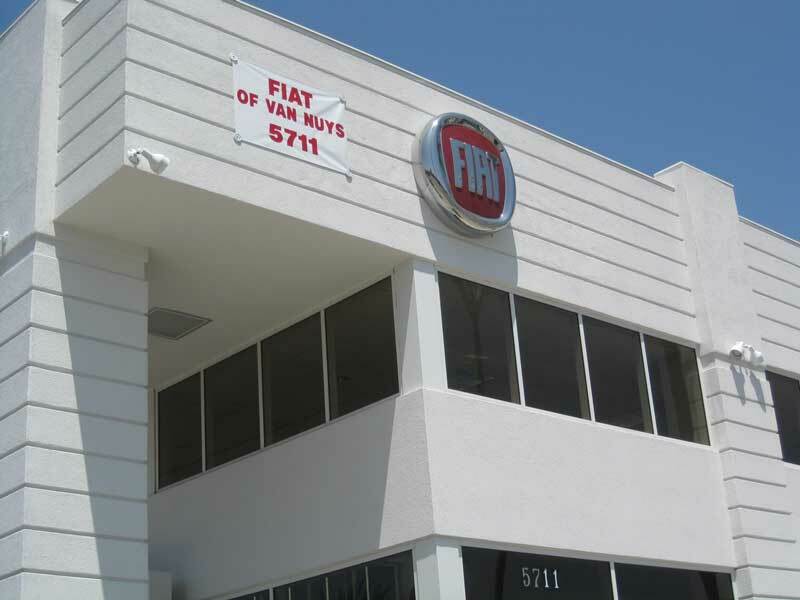 Fiat of Van Nuys is at 5711 Van Nuys Blvd. It used to be a Subaru store. Back in November 2010 I attended the opening of the first Fiat Studio in Downtown Los Angeles – a company-owned all-brand extravaganza named Motor Village. At that time I complained that the list of Fiat Studios (that’s Italian for dealerships) didn’t include any Metro LA or Valley locations. Unless you work in Downtown LA, no one on the West Side wants to drive to the USC-adjacent Motor Village to buy or service a Fiat. 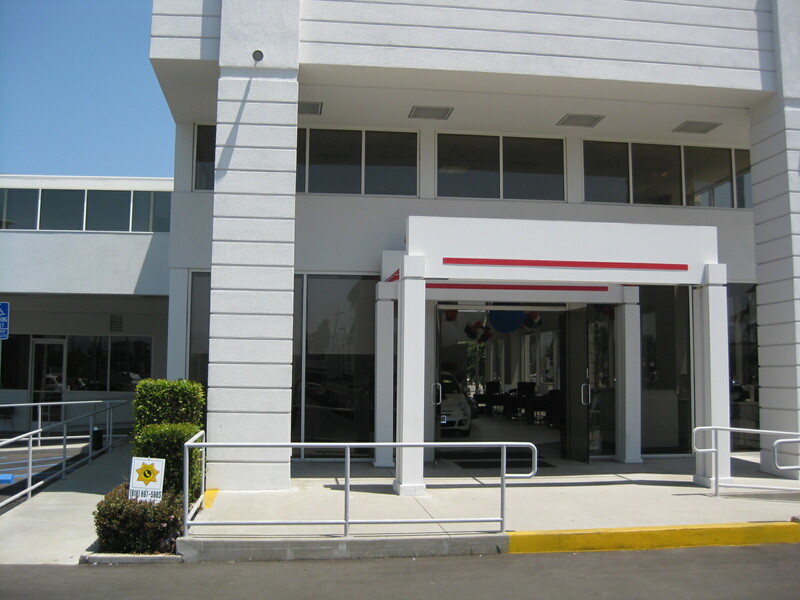 At the very least, there should have been a Fiat Studio in either Santa Monica or Van Nuys, where there are high concentrations of car dealerships. I’d like to think that the bosses in Auburn Hills heard my wishes; but it’s much more likely that a growing dealer group saw an opportunity to fill the vacuum in LA. 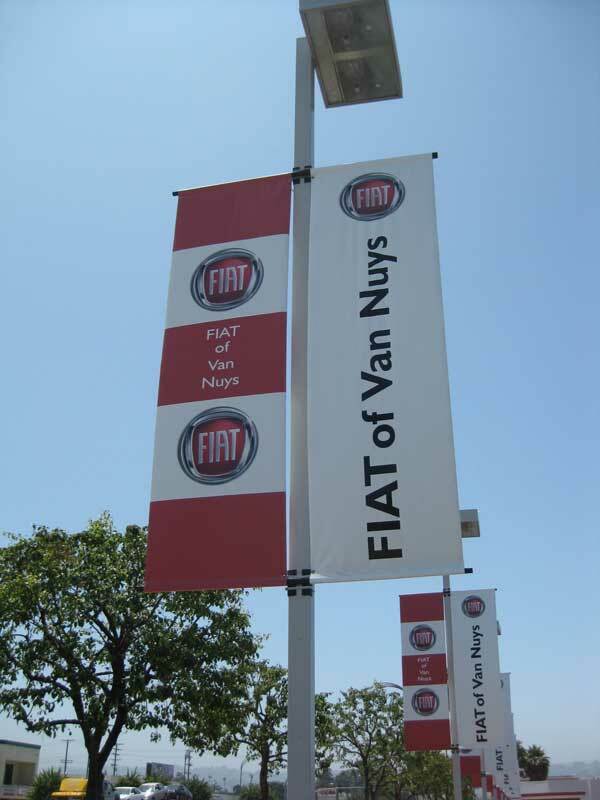 In place of a closed Subaru store on Van Nuys Blvd, the new Fiat of Van Nuys rises. The dealership isn’t quite complete yet. They are still putting finishing touches on the service bays and showroom. However, what is important is inventory. Based on my experiences at other Fiat Studios (South Bay and Cathedral City), I thought these little jewels were in short supply. I’d even heard of dealer markups (a really abhorrent practice) which happens when a high demand model is in short supply. The stucco is still fresh and there's no signage yet on the side showroom entrance. 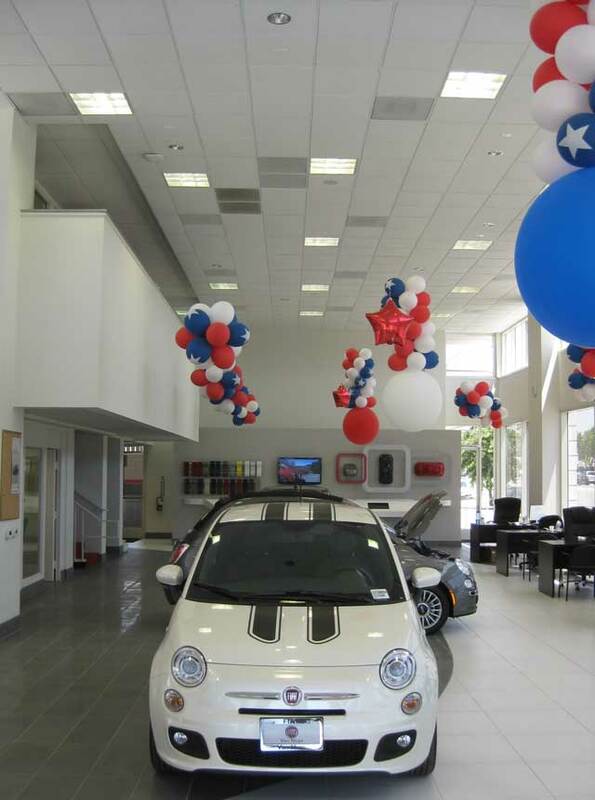 The new Fiat store is part of the growing California Superstores Automotive Group that already has two Fiat Studios (Sacramento and Freemont) and just opened the new Van Nuys Chrysler Dodge Jeep Ram. We needed another store in the area as there are no Dodge dealerships in Metro LA and Big Valley Dodge closed during Chrysler’s bankruptcy. 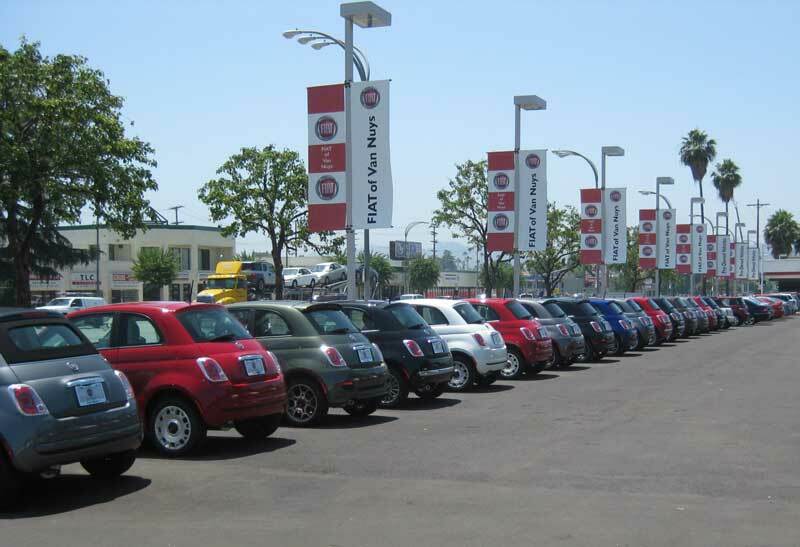 Fiat of Van Nuys has rows of cars to choose from. Sixty, seventy, ninety – they just keep coming from Chrysler’s factory in Mexico that used to produce the PT Cruiser (which was euthanized, mercifully, a couple years ago). Practically every interior and exterior color combination is represented including coupe and cabriolet models in Pop, Sport or Lounge trims. 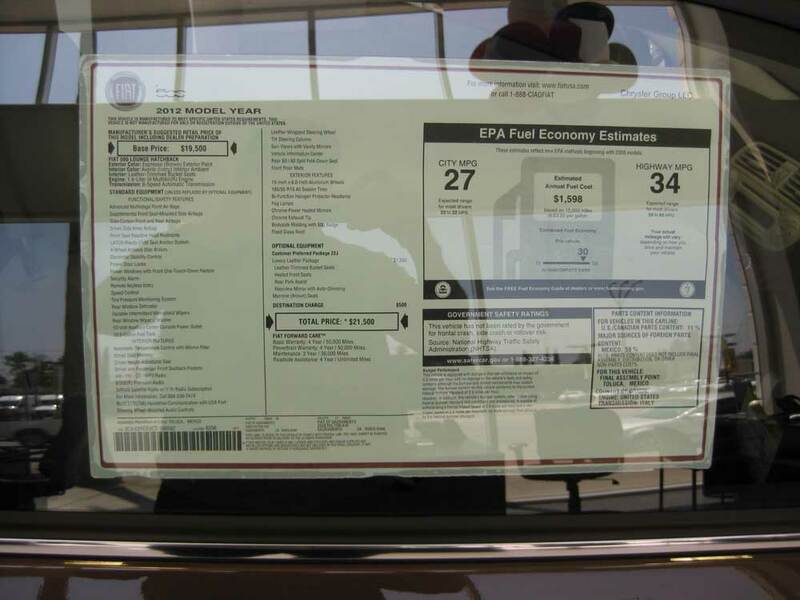 There were no dealer markups on the window stickers; however, some sported tinted windows which were extra. Row after row of new Fiat 500s. I like to see lots of inventory as it means there is a better chance of having the model I want in the color I want and I won't be ripped off because it's in such short supply. Certified Fiat Specialist Elizabeth Chase told me that the vast majority of models sold were equipped with automatic transmission. In the US, over 90% of new cars don’t have a clutch pedal. I always see car magazines test the manual transmission models and then wax lyrical about rowing gears. Yeah, that’s nice on winding roads, manufacturer junkets in Sonoma and test tracks; but in LA traffic, with food and electronic distractions? Forget it. The June Gloom morning burned off into a warm Valley day, so I thought I should drive the 500 Cabrio Lounge (MSRP $23,500) as well as the most popular Sport Coupe. Riding shotgun and playing information guide was Marco Klug, Marketing Manager. The Cabrio isn’t the traditional convertible we expect with a disappearing roof. Instead, Fiat retained the Coupe’s roof rails and opened the top like a sardine can. The trick canvas power folding top looks great and can be stopped at any time like a sunroof but the first factory programmed stop is just above the rear seats (if you can squeeze back there) which leaves the rear window up. 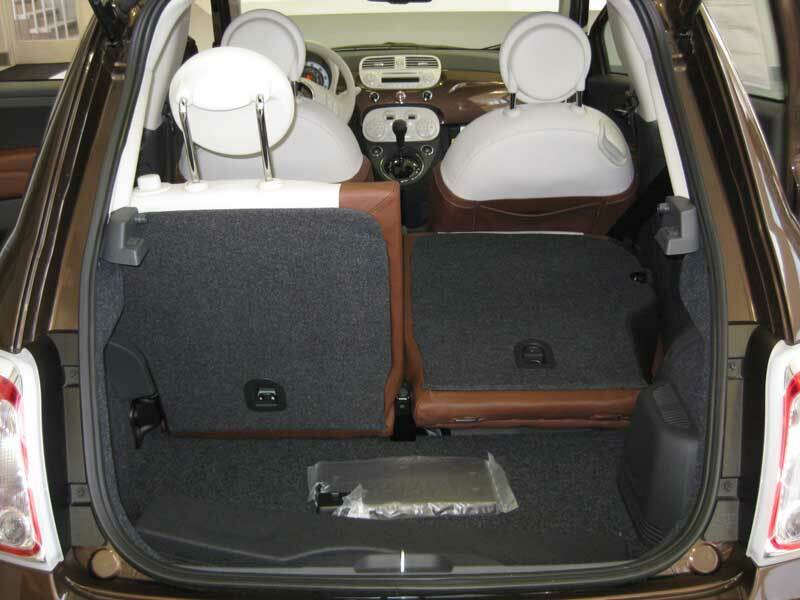 This is the natural way to drive the Fiat as when the top’s fully accordioned, the rear visibility is zero. The thick B pillars don’t help much either. You have to rely on the standard backup sensors and the side mirrors with convex wingtips to back up without hitting someone or something. The summer sun started to singe my hair so I closed the top and hit the automatic climate control button. The AC blows hard and cold and reaches the back seat easily (it’s not like you have the Grand Canyon behind you). The Cabrio’s thick canvas top seals the roof and interior decibels don’t suffer much from the fixed tin roof version. The $1,250 Luxury Leather package creates a bespoke interior featuring Italian two-tone heated leathers and an auto-dimming rearview mirror. Worth it. 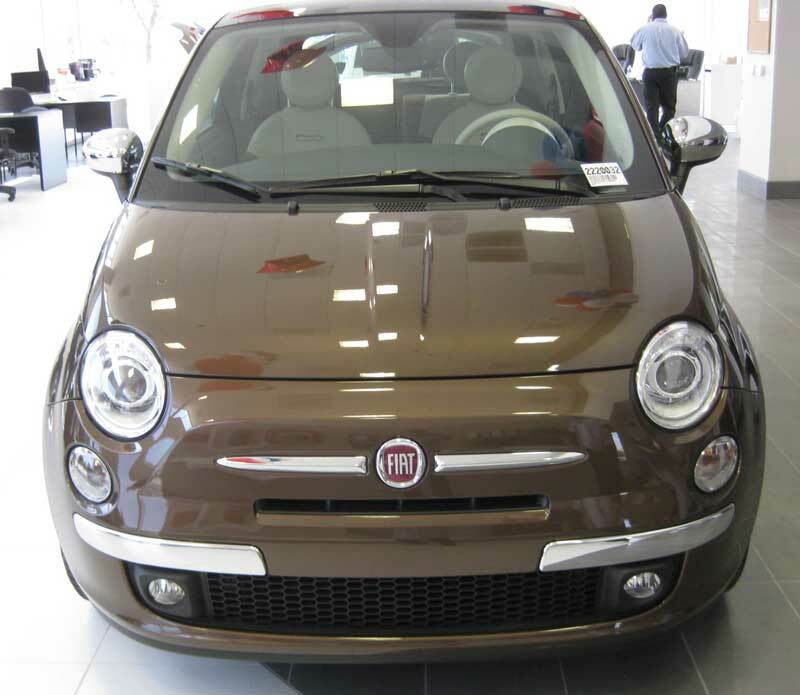 A 2012 Fiat 500 Hatchback with Pelle Marrone/Avorio (brown/ivory) luxury leather interior. 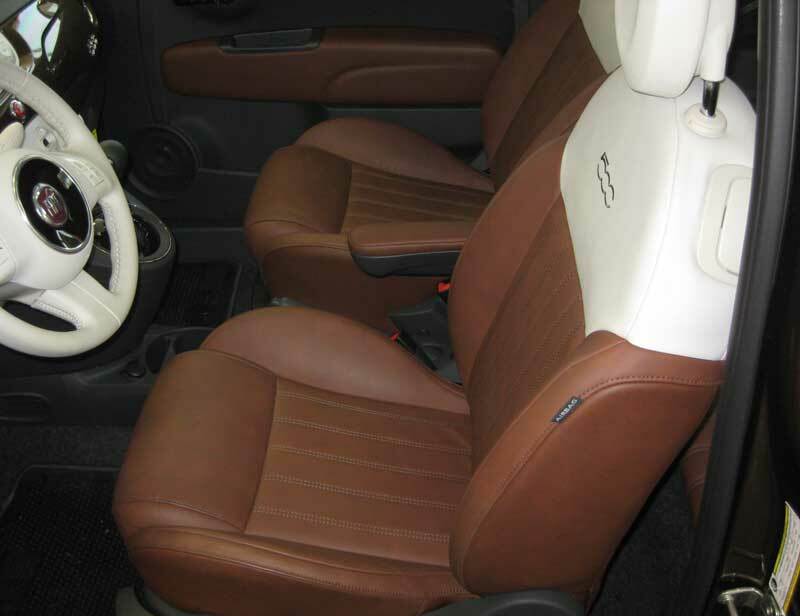 The Cabrio Lounge comes standard with the Bose Sound package, Sirius Satellite radio and an alarm system and it really shakes the little Fiat to its rubber boots. 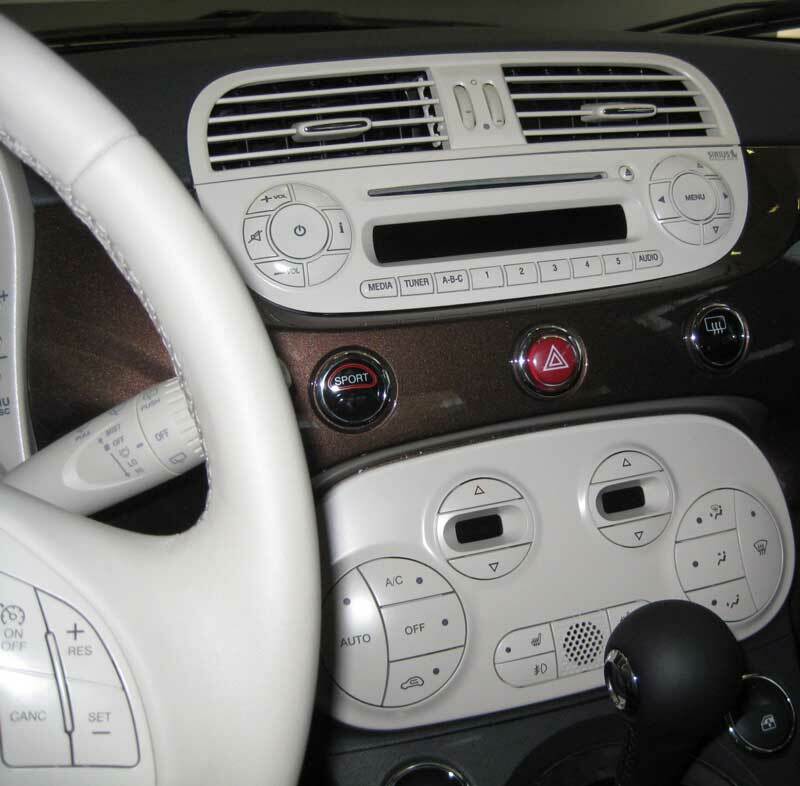 BLUE&ME, Fiat’s Bluetooth hand-free, voice-activated communications system with a USB port and iPod Control is also standard. The glove box ports would be better in the center console. 2012 Fiat 500 Lounge center console. Note the 2-zone automatic climate control. It takes just a few minutes to learn the controls. The 1.4 liter 16 valve 101 hp 98 lb-ft torque MultiPort (Fiat’s proprietary fuel injection with variable valve timing system) four-banger (the only engine currently available) has its work cut out for it even with a relatively lightweight 2,434 lb curb weight. The six-speed automatic shifts smoothly and does its best to keep the engine revs tamed to maximize fuel economy. 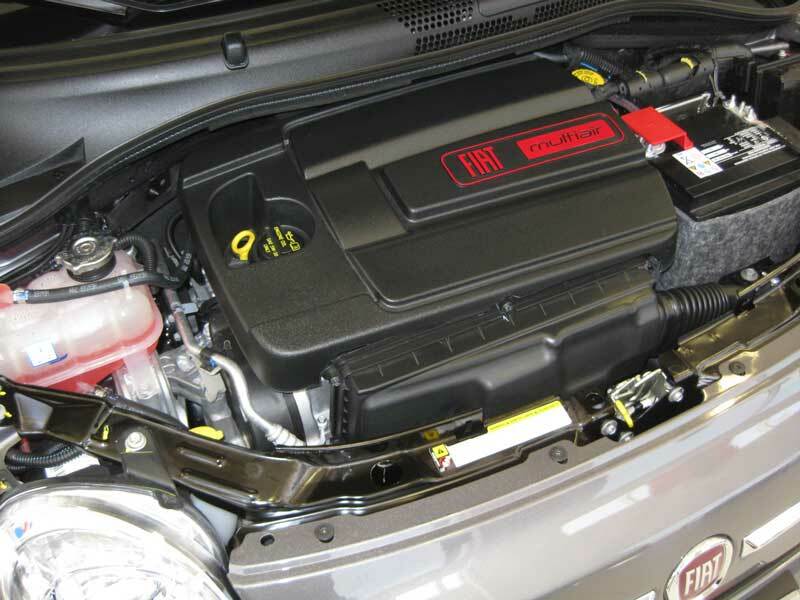 Fiat's 1.4 Liter MultiAir engine pumps out 101 hp and 98 lb-ft torque. The manual mode, shifted with the center gear selector, worked well, although I found it counter intuitive to tip down for up shifts and up for down. That said, the powertrain did an admirable job toting three adults around the streets of Van Nuys; it just could use a few extra cavalli. The upcoming Abarth edition should be the remedy, if you’re so inclined. Fuel economy is good, not great. The Sport automatic is EPA rated at 27 city/34 highway 30 combined. The Cabrio I drove was slightly less at 27 city/32 highway 29 combined. But hey, you have so much fun and look so good, the fuel economy is secondary. Mercifully, Fiat avoided the cement shoes (a.k.a. run-flat tires) fitted on its MINI Cooper rival. The 15” wheels wear real tires with compliant sidewalls that, with the help of a well-tuned suspension, soak up rough roads far better than the tightly strung German-engineered MINI. While the MINI handles better, the Fiat is more comfortable in daily driving. I’d like to do a longer test to see how the little Fiat fares on rougher roads, hills and freeways. The Sport Coupe has slight tweaks to the suspension and steering to give it a more sporty feel. Push the sport button on the center console and the computer changes steering and shift algorithms. I didn’t get much of a chance to experience the difference, but I know I preferred the Sports’ cloth seats with added thigh and lateral support. Again, a longer test is in order. So who is buying this saucy, fresh Italian icon? For many buyers, it’s a cute and stylish addition to their fleet. When you aren’t driving your Bentley or Ferrari, you can take the Fiat 500 out for a spin. Or toss the keys to the maid for a quick grocery run. Who couldn't love the face of the little 500? It's small, but with the large hatch, you can fit lots of dorm room stuff inside. Then there are the style-conscious value buyers. Most of these cars sell in the $18 – $20,000 range and most you can spend is around $24,000 for the top-of-the line Cabrio. The Fiat Cinquecento is a great first car, graduation gift or even a nostalgia buy for those who fondly remember the original. This is no Fix It Again Tony car; it comes with a generous 4 years/50,000 warranty generally reserved for luxury brands and it includes 3 years of complimentary routine maintenance. 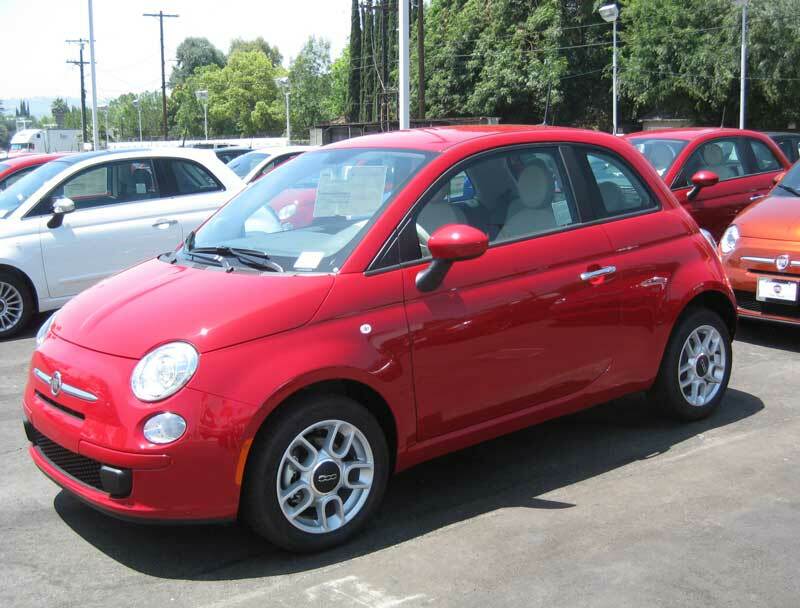 I think the 500’s diminutive European charm and good manners will win over a whole new generation of customers and do yeoman’s work reintroducing the Fiat brand to the US. The showroom, while not quite complete, is ready for the 4th of July sales. 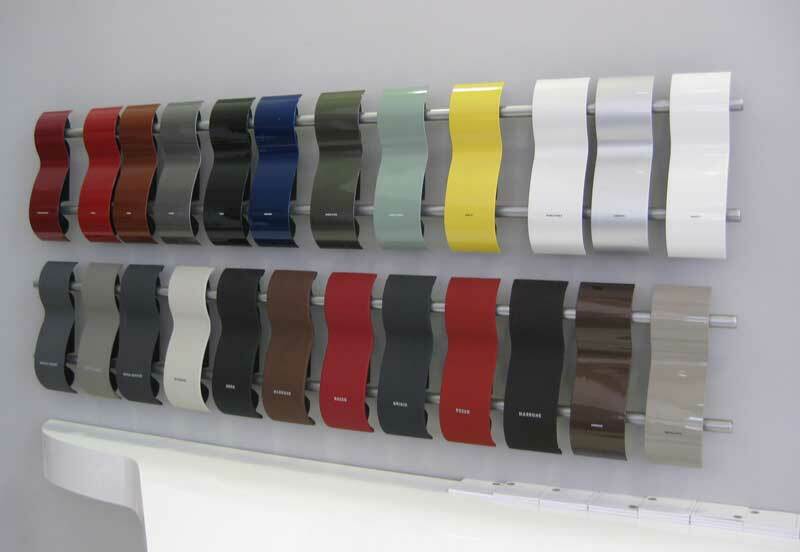 Fiat's palette of exterior and interior colors and materials. 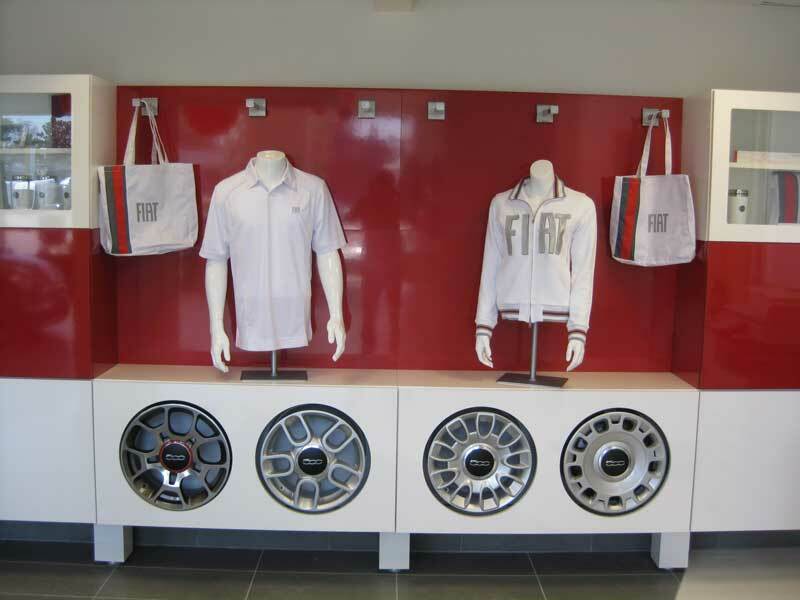 Of course, every Fiat Studio has an accessories and lifestyle shop. I LOVE that sweat jacket. My hosts Elizabeth Chase and Marco Klug. The rows of Fiat 500s just go on and on. I drove a couple of these at the Concours on Rodeo and they sort of didn’t do it for me, which was too bad. I’m glad they are making more automatics; most Americans (especially in LA) don’t want a stick, and I thought the one on this car was extremely disappointing. Tom, the little engine needs more power to work with the automatic, but for most people buying the 500, I’m not sure it matters. Enthusiasts will wait for the Abarth. It’s an icon and it has Italian style and hopefully a good reliability record. I’m hoping to get one, maybe a loaded Sport, to test for a weekend. 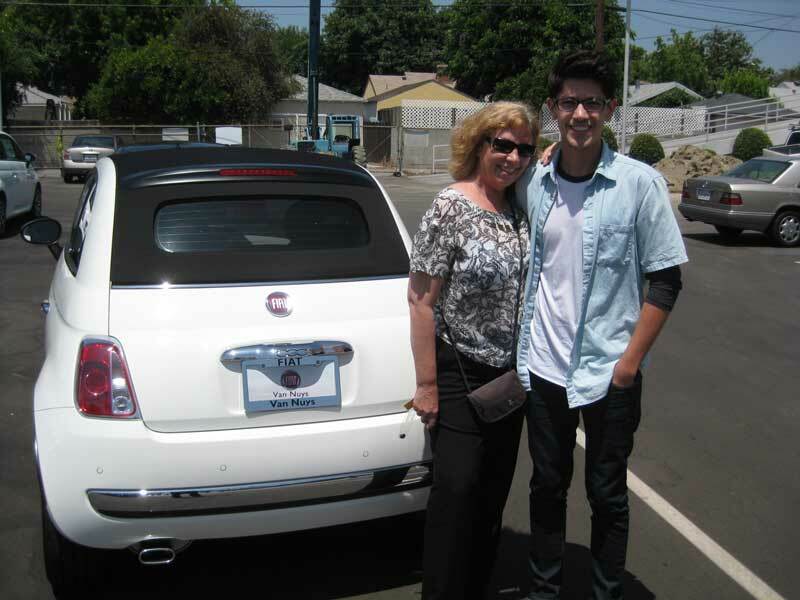 Hi Bronson, come to Fiat or email me and I’ll be happy to show you the New Fiat 500! elizabeth chase. Who is buying the Chevy Volt? BMW Drifts the US Bank Tower – Real or Fake?